Have you seen the Big Rig Jig? Have you heard of it? For those who are not aware, it’s a sculpture visualized and designed by the Brooklyn artist Mike Ross and built by crew of artists at American steel in Oakland. 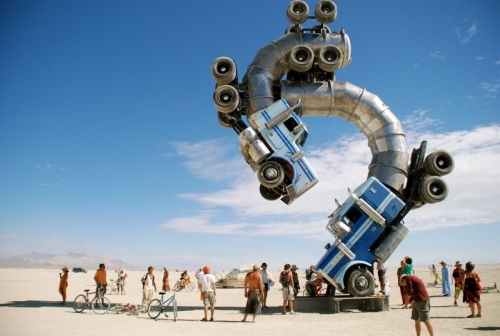 This is built from two decommissioned 18 – wheeler giant tanker trucks which are curved to each other at the same time balancing on the Playa. The Big Rig Jig is reflection of mind which depicts the relationship between the humankind and the nature. This sculpture references the global oil industry which is linked with our world’s social, economic, political and environmental systems. By reusing these rich objects, the artist has effectively managed to convey his admiration for human’s power and his apprehension towards it. This sculpture is a typical example of Mike Ross. This designer always works on large –scale sculptures since 1988. This is what he wants to describe about the Big Rig Jig, the twin 18 wheeler piece of art carved out of waste. Though we are getting into the details of the work, we can definitely say that this inspiration would definitely make an impact on the people’s minds. It would make people understand how much we depend on oil. This was actually introduced in Burning Man in 2007, but it still has some place reserved for display in the last few years at various events and festivals.